A recent study by the American Psychological found that 60% of Americans are stressed by money and work — who isn’t, right? The study also identified multiple negative effects of stress including anxiety, chest pains, fatigue, lack of sleep and depression. Well I’m not going to say that using one of these apps is going to solve something like depression or heal anyone of anxiety, but what they will do is improve your day, big time. 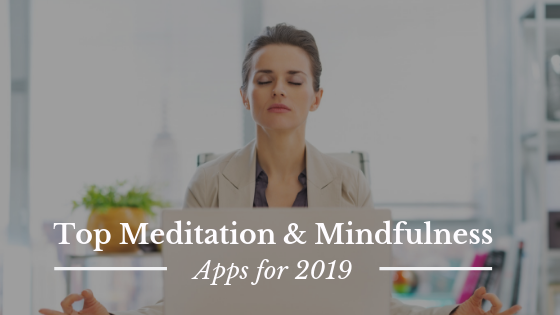 If you’re anything like me, a busy entrepreneur that has about 5 million things going on in my brain at any given moment, you’ll want take a moment and consider one of these apps to help you stay focused, steady and most importantly more mindful through out the day. Awarded App of the Year Award by Apple in 2017, and founded by Michael Acton Smith and Alex Tew. Calm is the ultimate app for mind and body. It teaches you how to take care of your body, meditate, sleep peacefully and focus. The app boasts a unique and vast library of Sleep Stories that will soothe you to peaceful slumber. The stories are narrated by famous voices such as Stephen Fry and Bob Ross. There are 10-minute guided videos on mindful movement and gentle stretching. The app is available for both Android and iOS. What we loved about it: We were all in consensus about the stories, even though it wasn’t bedtime for us when we listened the stories kept us engaged and off of email. Named iTunes 2018 New Apps We Love, Humm.ly was created by Joanna Yu the app draws on the ability of music to influence human behavior known as the iso-principle. It lays a foundation for therapeutic practices, thus helping you relax, be inspired and grow. First released in October 2017, Humm.ly has quickly become the most popular music therapy app. It offers an inspiring Mindfulness Journey to relax you. The music library is incredibly vast, and videos guides are categorized to help you achieve optimal results. What we loved about it: We loved how we could turn the guided voice up or down to adjust either the voice or background music. The app also triggered our competitive side as we competed against who was able to earn the most honey pots. Our favorite was the ‘presentation anxiety’ track, who doesn’t get nervous before big presentations! If you have a hectic schedule, HeadSpace founded by Andy Puddicombe the app is known for increasing focus, minimizing stress and boosting compassion. It comes with hundreds of short themed sessions that you can squeeze into a busy day. A 10-session pack consisting of 10-minute sessions is offered for free during download. The SOS meditations come handy when dealing with a crisis. There are 350 hours of guided meditation lessons that are even more intimate if you use noise-canceling headphones. What we loved about it: You can customize the app to match your goals and using it is easy. Omvana founded by Vishen Lakhiani features over 500 transformational audio tracks. They are grouped into multiple categories including lifestyle, body, relationships, hypnosis, and mind. It offers a 6 Phase Meditation guide to help you through multiple practices. These practices take 20 minutes to complete and help with connection, forgiveness, and gratitude. A free package is available, but the premium plans offer access to more features. What we loved about it: You can choose your own calming background music to listen to with the spoken meditation, we loved that! Insight Timer founded by Christopher Plowmanis a highly rated mindfulness app offers thousands of guided meditations. It boasts more than 5 million downloads, making it one of the most apps for reducing stress. Highlights include meditation timers, soothing sounds and customizable bells to optimize meditation sessions. Users of Insight Timer are part of a community that discusses important topics like spirituality and compassion. Groups like Be Here Now and Women Meditate Worldwide provide valuable insight into some of the questions you have. The app also logs milestones and stats to help track your progress. What we loved about it: Brand new meditations are uploaded every morning and the supportive community. Buddhify founded by Rohan Gunatillake offers 80+ meditation sessions organized by themes such as waking up, eating, work break, difficult emotions, traveling and feeling stressful themes. It is one of the most popular go-to apps for anxiety, and can be customized to suit your needs. The meditations are short and can easily be squeezed into a busy schedule. As such, it comes in handy for individuals who are always on the go. What we loved about it: You could tell the apps creator is an entrepreneur, the apps flow felt very holistic to our workday. iMindfulness is available in English, Norwegian and Danish. Founded by Jon Kabat-Zinn the app is incredibly versatile and can be used by beginners looking to learn mindful meditation or pros who want to maintain their practice. The app is compatible with iOS devices and offers three guided meditations, i.e., breath meditation, power pause, and body scan. Also, there is a timer for ensuring that you don’t worry about how much time has passed since the session started. A variety of in-app purchases allow access to advanced features for exploring mindfulness. What we loved about it: The app did a great job keeping us focused and brining us back when we got distracted. Conclusion: they’re all great apps and its just a matter of which one you vibe with and best suits your needs. Named CIO's Female Entrepreneur to follow, member of the Forbes Agency Council and Entrepreneur Magazine’s expert PR contributor. Danielle started her career on Wall Street at just 19 years old becoming one of the youngest traders in the industry. After a successful corporate career, she went on to found her marketing and PR agency Tribe Builder Media. Her agency’s successful PR campaigns through the years has not only gained the trust of many high-profile CEO’s, professional athletes and celebrities but also played an integral part in its client's achieving prestigious awards such as Inc 500, Forbes Next Billion Dollar Startup, Entrepreneur 360 among other top level recognition. Danielle and her work has also been featured in top-tier publications such as Forbes, Entrepreneur, and Inc. making her one of the most sought-after publicists and strategists in media. Slow Down To Do More: “How to Unhustle” with Ashley Graber and Milena Regos.